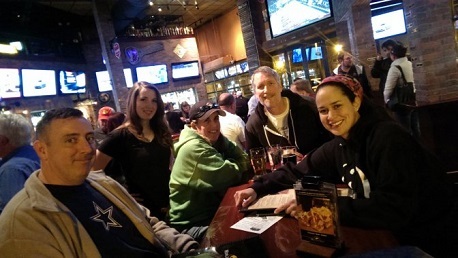 Thanks for coming out to Beer and Brats and playing trivia with the Pub Guys again! It's a cold December week, but some delicious Real Ale Coffee Porter warmed us all right up. We had some really tough questions this week, and a visual round that stumped almost everyone. It was a good night to be an astronomer. Or an astrologist. Either one, in this case. Game one saw Mouseaholics with a decisive win, thanks to their stellar knowledge; they were the only team that aced the visual round. Punching Ms. Daisy and WhizKid did a tie breaker for second place, with Punching edging them out for the prizes. Game two was a comeback story for sure, with a strong victory by Punching Ms. Daisy. We'll see you again next week, hopefully with lots of holiday music and ugly Christmas sweaters! Thanks for playing!